Huntington Beach, Calif. (May 27, 2011) – Enhanced Vision, America’s leading manufacturer of electronic magnifiers for the visually impaired, released a new 24” widescreen monitor option for their popular line of desktop video magnifiers. 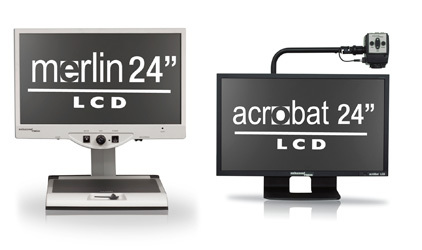 The Merlin LCD 24” and Acrobat LCD 24”, also known as CCTV’s, provide a wide range of magnification and contrast options to benefit individuals struggling with visual impairments such as Macular Degeneration, Retinitis Pigmentosa, Glaucoma and other various low vision diseases. Currently, more than 15 million people in the United States are diagnosed with low vision conditions, such as Macular Degeneration. With America’s aging population, this number is expected to double by 2020. Low Vision conditions make everyday activities like reading, writing, and ordering at restaurants a real challenge. Fortunately, leading eye care specialists have discovered that video magnification is a solution for these individuals to regain and maintain their independence. For more information about Enhanced Vision and its products, please call (888) 811-3161 or visit www.enhancedvision.com. Enhanced Vision is the leading developer of innovative products designed specifically for people who are legally blind, have macular degeneration, and other low-vision conditions. The company offers the most comprehensive line of electronic magnifying solutions and has helped thousands of people regain their visual independence. Enhanced Vision products provide individuals with the ability to read, write, watch TV, enjoy hobbies and live an active lifestyle again. Headquartered in Huntington Beach, Calif., Enhanced Vision products are available in more than 70 countries worldwide. For more information, please call (888) 811-3161 or visit www.enhancedvision.com.